A "rare" 650-year-old coin found in a secret drawer in a desk has been sold for £850 at auction. The 14th Century coin was discovered inside one of three hidden drawers in a 1970s bureau, left to a woman by a long-lost relative. Amy Clapp, from Derbyshire, inherited the piece of furniture from a great cousin and had taken it to be valued. 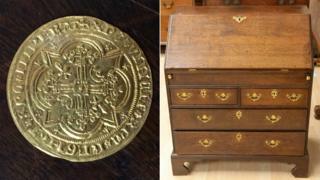 The coin was later found by a furniture valuer who checked its secret drawers "just in case". The bureau had already sold in February, for £260, but the coin - bought by a private collector in the Midlands - has now fetched hundreds more. However, it had been hoped the Raymond IV Prince of Orange Franc A Pied coin, which dates back to 1365, would double the guide price of £1,200 to £1,800. Edward Rycroft, from Hansons Auctioneers in Etwall, who found the coin, said he was still "delighted" for the Clapp family. "Instead of getting around £100 for a 1970s bureau we've helped her gain £1,000," he said. Mrs Clapp, from Swadlincote, who works as a family support worker, said some of the money would go to a charity that helps her 18-year-old daughter, who has Bardet-Biedl syndrome. "It's been an amazing experience," said Mrs Clapp, 37. "I would never have found that secret drawer in a million years. "We're so grateful to Edward. We recently blew all our savings on a car and its engine blew up shortly after we bought it, so this money is very welcome."